Kids being cruel to each other has existed long before the Internet was ever developed. In the ‘old days,’ a child would be picked on at school or on the playground but once they left that area, the ‘bullying’ would end. This is not so today. 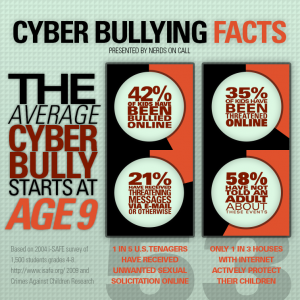 Cyberbullying, as it is called, can occur any time of day or night and can occur from anywhere. In addition, since nothing on the Internet ever goes away, when a child logs back onto a site, the comments or posts are still there. Plus, since most sites are public, every posting can and is seen by their friends, friends of friends and so on. Recent research found that 32% of online teens have experienced some form of harassment via the Internet, including private material being forwarded without permission, threatening messages and embarrassing photos posted without their consent. 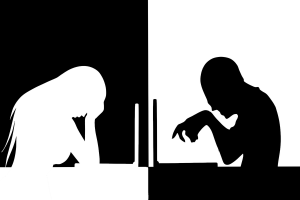 The perceived anonymity of the Internet allows for kids and teens to go further and type very shocking online statements or to post inappropriate pictures because they believe that they are not accountable for their online behaviors. 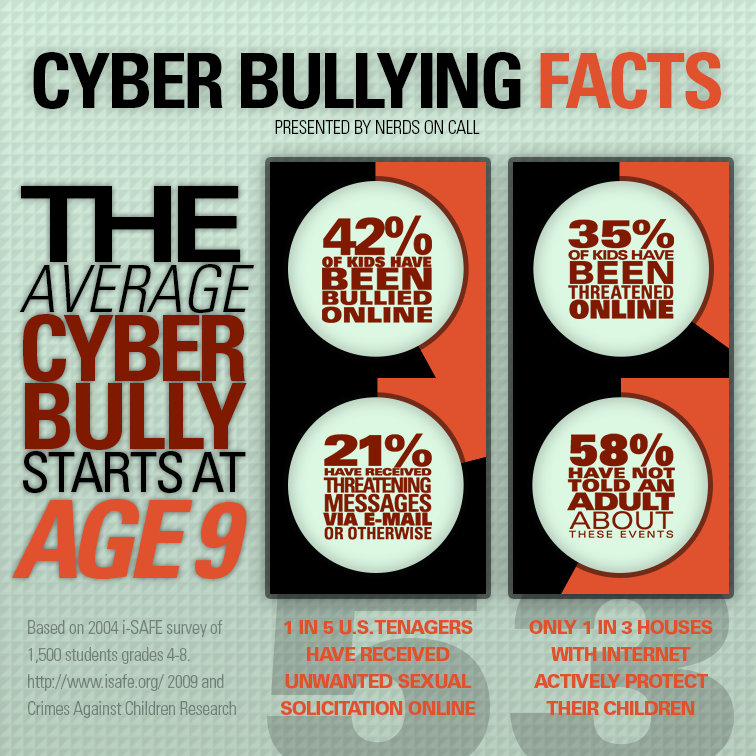 What can I do to keep my child safe from Cyberbullying? Although you can’t do much to prevent your child from being bullied online, you can help them end the harassment if it starts. Open communication is the most important intervention you can make. Don’t be afraid to get involved. If you think your child is being bullied, advise them to spend less time on the site in question, or flag the bully by notifying the Website. Almost all online communication sites, and every social media app, provides the ability to report inappropriate use of their site. If the behavior is also happening at school, notify the school’s administrators so that they, too, can get involved. Further ideas on what to do as a parent can be found in this helpful attachment. 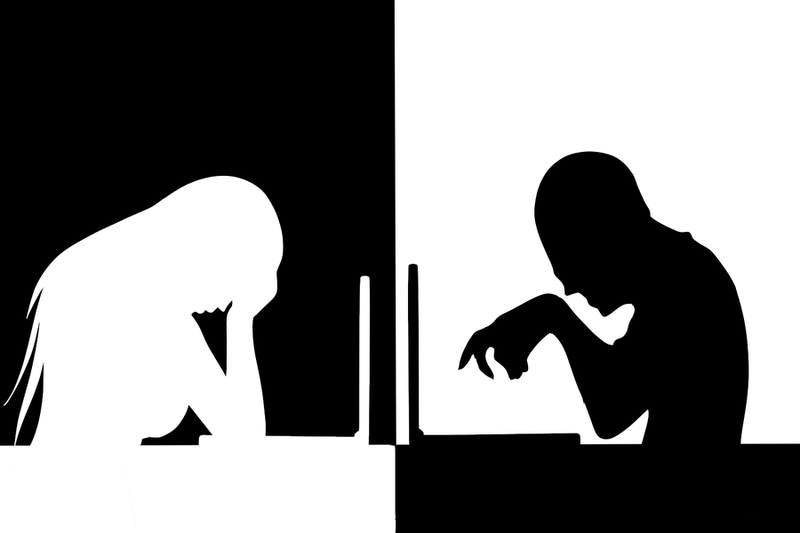 First, discuss with your child why cyberbullying is hurtful, and bring up some of the tragic cases of teen suicide related to online harassment. Try to understand that your child could be reacting to pressure from friends, or that your child may be retaliating against someone who hurt their feelings in a similar manner. Although such circumstances don’t excuse the behavior, learning about them could bring a larger issue to your attention. Finally, establish a set of rules for your child to follow when online. Don’t get upset with your child, try and talk with other adults to work through any emotions you have about the situation. Don’t ignore the situation or blame someone else. As a role model, it is best to show your child that taking responsibility for your own actions is the right thing to do. If your child was cyberbullying in retaliation, you should tell them that two wrongs cannot make a right. Be aware that any child is capable of such behaviors. Lots of parents are surprised to learn that their child could act out so negatively. 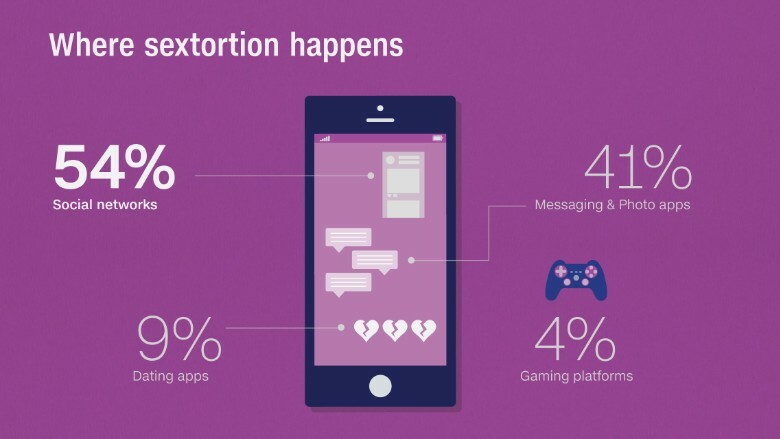 Sextortion is basically a type of extortion with a twist. Instead of extorting money or material goods from a victim, a sextortionist will extract sexual favors from the victim by using intimidation, fear, and blackmail. The likely victims of this new type of exploitation are teens since they possess many if not all of the risk factors associated with it. It typically starts with a teen taking pictures or videos of themselves in a provocative or sexual manner that are uploaded to the web. Though the teen may think they are sending these to a trusted online friend, sometimes these images find their way onto the Internet at large. In fact, many online predators pose as same age peers to lure a teen into a flirtatious online relationship where exchanging these images occur. What happens next is really unfortunate. When a sextortionist grabs any photo of a teen naked or anything that shows sensuality, he/she uses this as a weapon for blackmail. He/she then finds a way to contact or reach the teen in the photo and then tells the teen to send more images or videos or else he/she will tell everyone about it. The teen is left in a state of fear and confusion, feeling they have no choice but to send more material just for the sextortionist to refrain from placing them under a cloud of embarrassment and shame. How do I keep my teen safe from sextortion? Prevention is always better than cure. By the time your teen is blackmailed by a sextortionist, you are left without a choice but to risk embarrassment and trauma for your son or daughter. So the best thing to do is prevent it from happening. Educate your kids about the dangers of sexting and emphasize to them how distressing it can be when someone is able to get hold of those racy photos and videos. Reassure them that you will not overact in anger if they do get caught up in this form of sexual extortion. Their fear of your punishment is one of the main tools a sextortionist can use to keep control of your child. You certainly have every right to punish them for deliberately disobeying you, but your first concern is, of course, their safety and helping them find justice for the crime committed. Monitor your teen’s activities especially those that involve the internet. You can even install parental software and programs just to make sure that they aren’t exposed to sexually explicit material over the web. These are simple yet helpful things you can do in order to make an effort in protecting your kids against sextortion.